AI is on the tongue of every forward-thinking business leader. And it's causing a rapid shift from AI and automation being nice-to-haves to becoming expected features in every business software product. Every software product is expected to offer insights into the data they hold for organizations, but basic charts are not enough. The data is aggregated and it is difficult to unearth actionable insights. This is where AI and automation come in. Already, data discovery can be automated. Machine learning capabilities are able to search data and deliver notifications of changes and correlations tailored to the particular user. Points on a report can be compared with natural language generated explanations. The race to automated analytics is on. Are you a software product owner? Then you need to embrace the race to AI and automation and ensure you meet customers' needs for data insights and to stay competitive. Build or Buy to Get Analytics with AI? To keep up in this race, you have two options as a software product owner: build your own analytics capability, or embed a third party analytics platform. As you are a software company, it would seem to make sense to use the dev resources you have in-house to create analytics capabilities for your product. After all, that should ensure it is fully and easily integrated. But, experience gained from working with hundreds of product owners would suggest otherwise. In the same way that you cannot build your product once and just keep an eye on it to ensure there are no issues, you cannot build an analytics module and assume you're done. Analytics software is an entire industry in its own right, and for good reason. Needs, capabilities, and demand are constantly evolving. To keep up with the pace of demand, you would need a large team dedicated to the analytics module full-time, despite the fact that it isn't your core product. But analytics vendors that build business intelligence (BI) platforms you can easily embed, have exactly that — dedicated teams and exceptional functionality. In spite of what many software owners first think, embedding a third-party analytics platform is usually the better option. By embedding, you take the fast track. You take advantage of the hundreds of development years that go into building world-class BI, and you can embed that capability within a matter of days. Plus, with pre-built content, it can be just a few months before you ship. Building even the basic capabilities from scratch often takes over a year. BI platforms are, of course, built with best-practice analytics in mind. It sounds obvious, but you may not realize that this is a whole new skill set your dev team would have to learn before they could build an analytics module that would meet the high standard required in this age of data deluge. The quality of the analytics component directly impacts the value of your software company, so you cannot get away with a reasonable attempt; you need excellent analytics. Analytics vendors are constantly improving their offering and you can piggyback on their success to offer your customers more enhanced analytics capabilities without sacrificing years of dev and R&D time from your main product. That includes the new AI and automation powers that have become more readily available over the past two years. If you want to drive up the value of your product, you need to deliver the data analytics that businesses are demanding now as well as the automation they will be demanding in the near future. Automation will soon be non-negotiable. If you decide to embed an analytics platform, you need to choose your vendor carefully because you are partnering their software with yours. Choose a platform that can be integrated easily. The easier the integration, the faster you can ship and start reaping the benefits of having your customers rely on your software for insights into their business. But make sure the platform is scalable too. If it doesn't scale, your whole product's expansion will be limited. Also make sure that the analytics vendor is flexible. The problem you are trying to solve for your customers today may look very different in a couple of years. You need to look for a vendor that will price a commercial model that makes sense for your business today and that can adapt in the future. Will you charge customers extra for the analytics module, or will you include it in the price? Are you charging your customers a monthly subscription fee or are they purchasing it outright? Any vendor worth partnering with will accommodate your business model so you both win from the partnership. Look for strong functionality and innovation too. The analytics landscape is rapidly changing and you need a platform that will stay ahead of the curve so your product is never held back by its analytics module. Third-party and independent analyst evaluations are incredibly helpful here. The data revolution happening in businesses today has consequences as far-reaching as the Industrial Revolution. Soon, every organization will demand automated and AI-enhanced analytics of every area of their business and departments will turn to their software for answers. Delivering analytics and insights to your customer will add deep value to your product as they rely on it for their day-to-day decision making. So it is worth getting your analytics offering right, and it needs to happen fast. 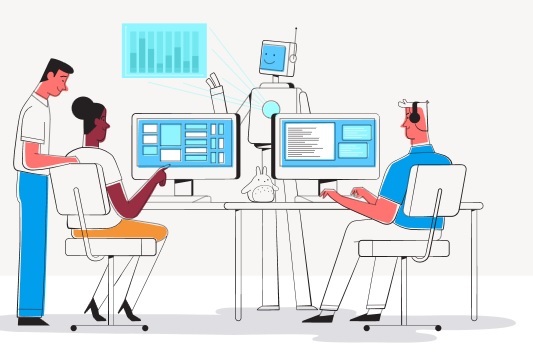 With the right analytics partner, you will be on the fast track to embedding AI and automation into your software product so you can multiply your application's value.